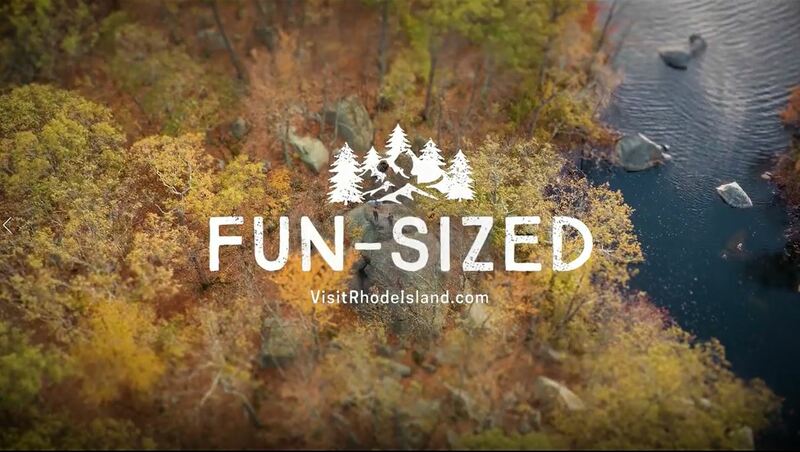 THE R.I. COMMERCE CORP. launched a new tourism marketing campaign in November touting Rhode Island as "Fun-Sized." / COURTESY R.I. COMMERCE CORP.
PROVIDENCE – There will be no successor to the much-criticized 2016 “Cooler & Warmer” state tourism campaign, R.I. Commerce Corp. Chief Marketing Officer Lara Salamano told Providence Business News Tuesday. Instead, with little fanfare, Commerce rolled out a new website in October and a digital ad campaign in November that will be followed up by some spot television advertising in targeted markets, she said. “We will never do another tagline or motto,” she said, referring to a public backlash after the unveiling of the state’s much-hyped tourism marketing campaign that led to the resignation of her predecessor, Betsy Wall, in April 2016. Wall resigned just days after an error-filled rollout of a new statewide tourism campaign that included a quickly abandoned “Rhode Island: Cooler & Warmer” slogan. Several regional tourism directors told PBN in September 2017 they were hoping a new marketing plan would unite each of their districts under a Rhode Island banner – a plan they believed would be coming from Commerce the following month. Salamano, however, told PBN “there never was a plan to do a big rollout” and that Commerce’s regional partners are “onboard” with the current marketing effort. Moving forward, marketing campaigns from Commerce will be piecemeal and focus on specific events, regions within the state and other selling points, she said. Designed to play on the right side of a browser where ads are usually placed and attract viewers to Commerce’s website, VisitRhodeIsland.com, the videos shown to PBN portray kayakers and rock climbers enjoying the state’s outdoor offerings. Each video closes with the phrase “Fun-Sized” front and center. Commerce is producing 12 to 15 of these videos, which Salamano said would have “a lot of leg and evolution to [them].” Commerce data shows a 61 percent average click-through rate for the videos when the industry benchmark is 45 percent. “Fun-sized” videos are playing in the Mid-Atlantic region and Florida, as well as Denver, New Orleans and Seattle. Additionally, Commerce plans to expand its marketing efforts internationally to locations which are serviced by Norwegian Air. Completely redesigned and rebuilt for roughly $250,000 by Tucson, Ariz.-based Simpleview Inc., VisitRhodeIsland.com will be at the core of Commerce’s marketing efforts going forward as it adopts mostly digital marketing practices. In early December, the site was augmented to include ADARA, a travel reservation booking software that allows Commerce to track the return on its marketing investments against the number of people booking through the site and money they spend on said reservations. Commerce spokesman Matt Sheaff said the site’s relaunch was publicly disclosed during the RFP process, as well as in Commerce board meetings and Tourism Study Commission meetings. PBN did cover the hiring of Simpleview in November, however there was no public relations rollout for the new website to match that of Cooler & Warmer. Salamano feels positive about the “Fun-Sized” marketing campaign, citing $260,000 in hotel room reservations through VisitRhodeIsland.com two weeks after the addition of ADARA. For comparison, according to Salamano, the state’s annual hotel room industry accounts for $23 million to $24 million. She hopes the site will also be used by locals to discover more of what the “Fun-Sized” state has to offer.